Tiger Woods wins U.S. Open, claims 14th Major Win! Tiger Woods has done it. 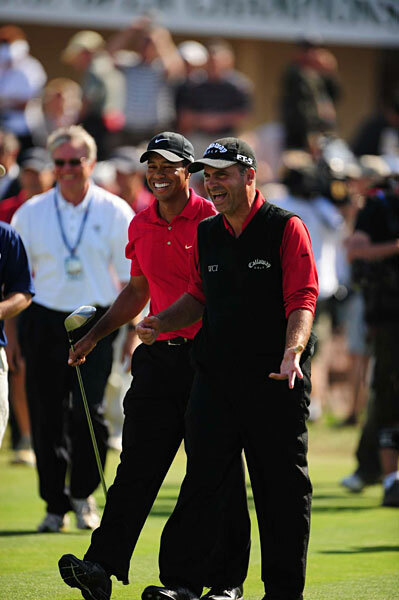 He has slain the mighty giant, Rocco Mediate, and claimed his 14th Major. He is now 4 major wins away from tying the all time leader, Jack Nicklaus, at 18. Sadly, I was unable to watch the final 18 round playoff, but I heard it was a doozy. They ended up going into a sudden death playoff after Tiger tied Mediate on the 18th hole with a birdie. They played the 7th hole in sudden death, and Tiger birdied to win the tournament.